Political battles are brewing across the U.S. over how municipal and state governments can keep their pension promises while balancing their strained budgets. After years of skimping on contributions — or skipping them altogether — some states are facing shortfalls too big to ignore. Last year, U.S. Rep. Devin Nunes drafted legislation that would finally reveal the full extent of each state's pension obligations. But before he introduced the bill to Congress, Nunes' legal counsel emailed a draft to Kellogg Associate Finance Professor Joshua Rauh, whose work is cited in the legislation. Rauh's research is "very, very instructive and compelling," said Nunes' senior policy adviser, Andrew House. "It certainly has been used extensively on Capitol Hill in the debate. If the bill passes, as we think it will before the end of this year, (Rauh) will have played a major role in national policy." 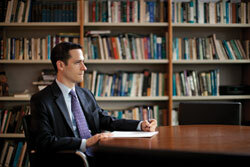 The Kellogg professor has emerged as a leading authority in the national debate over the cost of government pensions. His warnings that some public funds are on track to run out of money before the end of the decade have made headlines in major newspapers, and in February he testified before a Congressional subcommittee. Rauh is not the only Kellogg figure on the front lines of the pension crisis. A number of alumni are also playing important roles as investment managers, analysts and advisers at some of the largest public pension funds in the country. David Vanderweide '02, a fiscal analyst for the North Carolina General Assembly, says remedies such as raising the retirement age and reducing benefits for new hires will put some troubled plans on sounder footing. But other plans will require more urgent solutions. "We are in uncharted waters" if a large public plan defaults on its obligations, he says. Rauh says taxpayers are right to be concerned. According to his analysis, retirement systems in Louisiana, Illinois, New Jersey and Connecticut may run out of money by 2018. "Citibank was too big to fail," Rauh said. "Presumably Illinois and New Jersey would be too big to fail." As Rauh notes, state laws require that pension obligations be met. Therefore, Rauh says, pension liabilities ought to be valued using an equally certain, risk-free rate of return, such as Treasury rates. This move would force lawmakers to put aside more money for future obligations if they want to claim balanced budgets. Most states, however, have based the present value of their long-term obligations on the assumption that over time, their investments will generate returns comparable to the historic yields for equities. But as recent history has shown, such faith in the market may be misguided. "The belief that the stock market isn't risky over the long term is simply flawed," Rauh says. "The only reason that an asset might return more is that it entails risk." Rauh says pensions were underfunded well before the financial crisis, even when they appeared to be well funded by government accounting standards. His current estimate of the combined shortfall is $3 trillion, although some states are in far better shape than others. Those states include Wisconsin, where David Villa '79 is chief investment officer and chairman of the investment committee for the board that oversees pension assets, and where Gov. Scott Walker's controversial proposal to curtail union bargaining rights sparked mass protests in February and March. Villa manages one of the best-funded state retirement systems in the country, with $81.8 billion in pension assets and 566,000 participants. Wisconsin state and municipal employers regularly contribute the required amounts to state pension funds, a fact which no doubt contributes to the state's better-than-average outstanding reported funding. The Wisconsin plan's unusual structure, in which employees share some investment risk, also has an impact on its funding status. Under a traditional plan, annuity payments to retirees can rise due to cost-of-living adjustments, regardless of returns. But in Wisconsin, retirees are not part of the liability structure. Instead, they receive annuity adjustments based on the actual investment performance relative to the actuarial assumed rate of return. Thus, the employer is responsible for the investment outcome up to the point of retirement. After retirement, investment risk is shifted to the retirees. Due to this adjustment process, the retiree portion — which currently makes up half of the Wisconsin retirement system — is, by definition, always fully funded, according to Villa. Villa notes that annuity adjustments in 2006 and 2007, for example, totaled a positive 9.9 percent. In 2008, 2009 and 2010, the adjustments totaled negative 4.6 percent. In exchange for this arrangement, active employees in Wisconsin participate in investment performance that exceeds the investment-return target. Villa believes this can be a model for other systems seeking alternatives to the traditional pension-plan structure. During a CFA Institute conference in June, he presented a framework that would take into account such option-like features (currently unique to Wisconsin) when evaluating the health of pension plans. He believes such a framework could promote better governance and design of retirement savings plans without giving up the efficiency of a collective solution for replacing income in retirement. The situation is far different in New Jersey, where decades of underfunding have produced a deeply troubled system. With nearly 800,000 participants and $70.5 billion in assets, New Jersey's system reported a 62 percent funding ratio as of June 30, 2010. Last year, Tim Walsh '89 was recruited to direct the New Jersey Division of Investment. The Kellogg graduate — who worked in financial management for two decades before joining the Indiana State Teachers Retirement Fund's board of trustees in 2005 and becoming its chief investment officer in 2008 — shared some lessons learned over the last decade. Walsh observed that most public funds were unprepared for a period during which a series of shocks — the bursting of the tech bubble, the 9/11 terror attacks, the 2008 financial crisis and the ensuing recession — resulted in the benchmark S&P returning little better than 1 percent. "The key is to get even further diversified and implement proper risk controls to try to avoid those big shocks," he said, adding that his group in New Jersey aims to establish a "state of the art" risk-management program. In North Carolina, where Shawn Wischmeier '02 is chief investment officer for the North Carolina Department of State Treasurer, the pension system reflects a history of regular contributions and more conservative assumptions than many other states. With $74.2 billion in assets and 850,000 participants, the system reports 96 percent funding. Yet Wischmeier is also stepping up controls. He recently hired a new director of risk management to implement a more rigorous program, although the Kellogg graduate stressed the move is not in reaction to 2008 losses. "Because we were very well funded and we had a lot of available cash that we were able to invest, we took advantage of the pain in the market and we were able to make some very good investments at a very low level of risk," he said. The pension-funding debate will only intensify as the impact of the 2008 financial crisis is fully reflected by states themselves in a multi-year process called "smoothing." Reported funding levels are in steep decline. By 2013, aggregate state pension funding ratios on a reported basis are expected to fall to 72 percent, down from 84 percent three years ago, according to the Center for Retirement Research at Boston College. Rauh's methodology, which removes the effect of smoothing and corrects the accounting of liabilities, finds aggregate funding ratios at 43 percent. Rauh and his co-author Robert Novy-Marx, an assistant professor at the University of Rochester, last year proposed that states be allowed to issue tax-exempt bonds to pay off their pension debt. But states would only qualify for the tax exemption if they agreed to place new employees in defined-contribution 401(k) plans rather than traditional pensions. All new hires would also be eligible for Social Security. Rauh's future research will look into hybrid pension plans, such as conditionally indexed plans that pay cost-of-living increases only if returns hit certain targets. Another solution is to allow employees to buy into state-managed investment pools, such as the California Public Employee Retirement System. Most immediately, he said, states need to adopt uniform accounting such as that proposed in Nunes' bill, the Public Employees Pension Transparency Act. The bill would require states to report their liabilities to the federal government using specified Treasury and bond rates, rather than the equity-like rates most states use. These lower-return assumptions would therefore imply much larger minimum contributions if states want to claim to the federal government that they are running balanced budgets. "This is not a partisan issue," Rauh said. "The less you're contributing now, the greater problems you're sowing for the future."